Measured Items are any item that are measured in some way (weight, length, time, etc). Check the 'Item sold by measurement..'. Select the unit of the item. If the unit is not in the list, you can create an item. For our Tomatoes example, we will select Kg. You can choose if the default capture method will be the amount or the weight. If your scale prints out the amount, you can choose amount, otherwise you can choose weight. The price will be the price per unit. In our example it will be the price for Tomatoes per KG. Apart from the default measurements (Weight and Time) you can also add your own or edit the units. 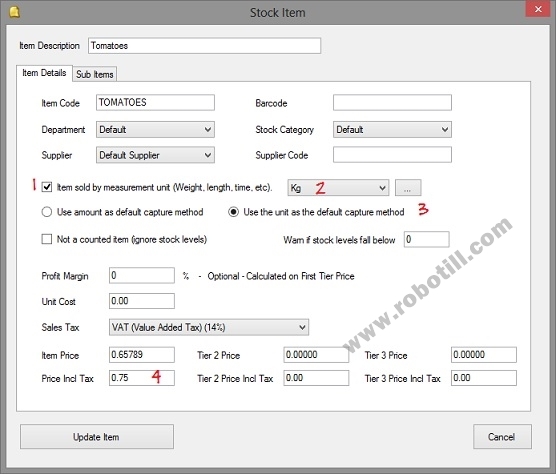 In ROBOTILL Manager click on Setup > System Configuration. Click on Retail Specific > Measured Units. The cashier can then just enter the weight and the system will calculate the price. 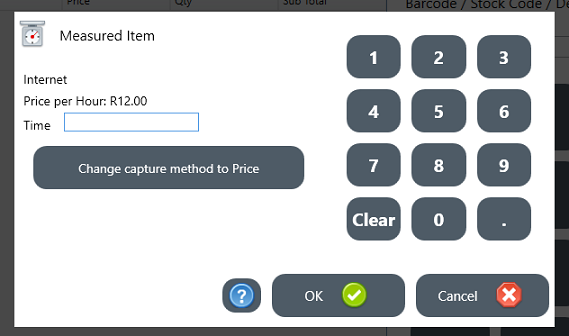 The cashier can also change the default capture method and enter the price instead of the weight. In that case the weight (quantity) will be calculated. Another example of a measured item would be a shop that sell Internet time on a computer. You can set up a Internet stock item and choose the unit as time. 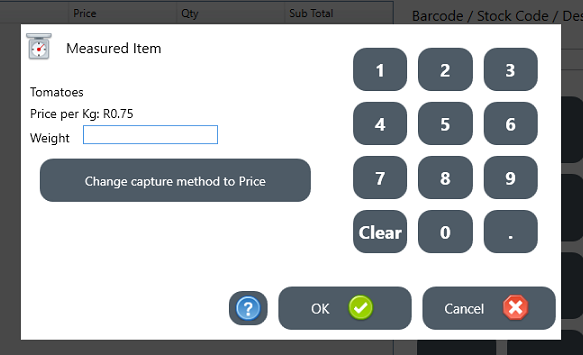 When that item is selected, the cashier will be prompted to enter the time and the amount will be calculated.